Refrigerators have the deserved reputation of energy hogs. They certainly do drive up your power bills so it’s important to keep the fridge on the right cooler setting as well as purchase a refrigerator that will give you better efficiency. They also run non-stop. Newer refrigerators will be better at this due to 1) Energy Star requirements and 2) U.S. Government mandated posted Energy Guide stickers. Recently, manufacturers are all clamoring for the blue Energy Star sticker and claim. 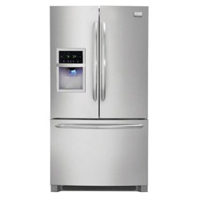 By Energy Star requirements, a refrigerator must be at least 20% more efficient than the Federal Dept. of Energy minimum. It serves as a useful guide, however how they determine which models get the Energy Star and which do not, requires some investigation. The Federal government now requires manufacturers to post an Energy Guide. This guide shows how much an appliance like a refrigerator costs you over a year compared with the average. The term used is ‘Estimated Yearly Operating Cost.” Funny thing is, every time I look at the attached yellow Energy Guide not a single model of refrigerator claims to be above the average. For example, the inexpensive Amana side by side fridge I’m currently looking at states an estimated yearly operating cost of $61. The sticker states a low end range of $60 to a high end of $78. Based on that, it doesn’t really seem to mean anything. If there is only a $18 difference for a whole year…well you get the picture. The “Energy Guide” also states the estimated yearly kWh use. For example the above referenced fridge registers 577 kWh. But what cooler setting is that power consumption based on? Further down in the bullet points the guide states this refrigerator is compared “based on models of similar capacity with this feature and that feature. Then it states that the estimated operating cost is based on the 2007 national average. Anyones utility bill kWh charge not gone up in the past 4 years? Frankly it’s about useless. Another government initiative gone bad? The Energy Star sticker is about as good as you are going to get for determining whether a refrigerator is energy efficient compared with the competition. Suffice it to say though that the focus on better energy efficiency (in technology terms) alone is causing manufacturers to focus on the subject – not the effectiveness of the programs. Fridges have grown larger and acquired more features in the last 40 years; however they have steadily decreased the amount of energy they use. Today’s refrigerators use less than one-third of the electricity than they did in the mid-1970s (per same size) but then we must look at those faulty manufactures specifications in storage capacity to determine if this is actually true. Under a new proposal by the Department of Energy an average new 20-cubic-foot refrigerator top freezer would consume approximately 390 kilowatt hours (kWh) per year – a reduction from about 900 kWh/year in 1990 and about 1,700 kWh/year in the early 1970s.